On Sunday afternoon, just inside the west entrance of the Philadelphia Museum of Art, there were no banners, no speeches -- nothing to indicate that a remarkable three-decade run by one of the museum's most visible features was coming to an end. Visitors by the hundreds moved past Marc Chagall's A Wheatfield on a Summer's Afternoon, with only a few pausing to take in the scene of a mysterious figure in a blue boat beneath a fiery red sun and saturated gold sky. Sunday was the enormous work's last day on display for an unspecified while, and its last-ever day in that spot. The wall on which it has hung will itself soon be gone, excised as part of the museum's coming massive renovation. Monday, art handlers took down the Chagall. When the museum reopens Tuesday, visitors will find the wall devoid of an old friend. As institutional icons go, Chagall's Wheatfield isn't up there with the unicorn tapestries nestled at the Cloisters, or Patience and Fortitude perched outside the New York Public Library -- or even gilded Diana with her bow and arrow at the top of the Philadelphia museum's Great Stair Hall. Still, it had been a highly visible stalwart, even if its position behind two beefy columns has always made a full view impossible. "I'm going to miss it," said a security guard Monday morning as art handlers and conservators were arriving to take it down. "When the sunlight comes in, it brightens everything up." 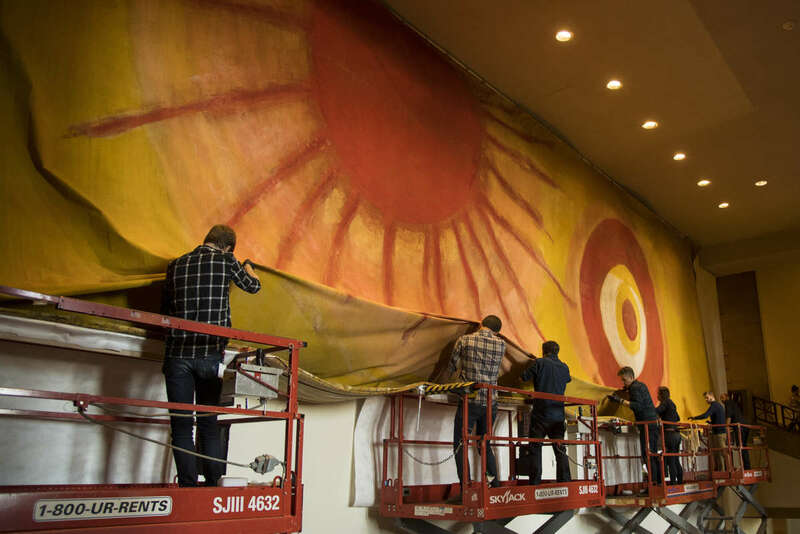 Workers remove Marc Chagall’s 1942 backdrop "A Wheatfield on a Summer’s Afternoon" from the west lobby of the Philadelphia Museum of Art on Monday. "Tedious" and "pompous," wrote a New York Times critic of the ballet when it was revived in 1968, though several generations of critics praised Chagall's backdrops for the story of a young man who falls in love with a gypsy girl and ends up killing her in a jealous rage. The art has endured. Wheatfield is being sent to Japan, where for the next four years it will join the other three backdrops from Aleko, all owned by the Aomori Museum of Art. The work is a souvenir of one of the Philadelphia museum's most popular shows, a Chagall retrospective in 1985 that drew 237,332 visitors in 10 weeks -- its second-most well-attended special exhibition at that time. Two Aleko backdrops were part of the show, and after it was over, Wheatfield's owners, Leslie and Stanley Westreich (she was an American Ballet Theatre board member), donated it to the museum. With only short interruptions, it has hung there ever since. Taking it down required some strategy. Actually, to come down, it had to go up. Monday, more than a dozen conservators and art handlers wearing black rubber gloves mounted four scissors lifts and started gathering it up, folding it like an accordion from the bottom. They folded a foot or two down in one direction, and then all four scissors lifts would rise in tandem and pause, and it would be folded in another direction, until, layer upon layer, the entire piece of fabric, thought to be cotton, was piled in one long narrow stretch. The artwork was carried on workers' shoulders into the Great Stair Hall, where it was rolled around a long tube and then lowered into a 35-foot-long plywood box. Then it was hoisted upon shoulders and carried into the Great Stair Hall, where it was laid out flat and rolled around a very long tube. Lowered into a 35-foot-long plywood box, it would be ready for its flight to Japan. Three decades of hanging in Lenfest Hall, as the west foyer is known, took its toll. During the last four weeks, the piece has undergone its first serious restoration. Dust was brushed off, and conservators and helpers went over it in patches of six inches by six to repair some flaking and powdering tempera paint. A clear liquid adhesive was applied to rebond paint with fabric, and a rubber soot sponge was used to lift off grime. Some areas were selectively retouched. "It's a change, of course," museum curator of modern art Matthew Affron says of Wheatfield's disappearance from its familiar spot. "It's become part of the environment of the west entrance and it's been on view for a long time." For now, the Chagall is being replaced with a scrim that shows a rendering of renovations to come in that space beyond the wall, which will be punctured in spring 2018. By the time Wheatfield returns in four years, the museum will be a very different place, well into its multiphase renovation and expansion. No decision has been made about when or where it might find a new spot after reinstallation of the modern collection. Given the piece's size, it's not even clear where it could go. Says Affron: "No doubt, I'm sure that is one of the many questions we will have."